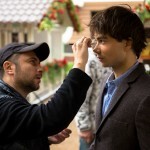 “Alexander Rybak has released the video for the song “Kitty”. The winner of “Eurovision-2009” Aleksandr Rybak has released a new song called “Cat” and a clip on it. This song is about love for a girl, which Alexander describes as a cat. Music video for the song was filmed in Moscow”.